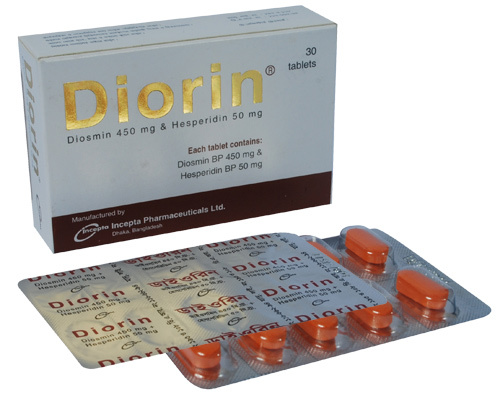 Diorin : Each tablet contains Diosmin (Micronized) BP 450 mg & Hesperidin BP 50 mg. The drug acts on the venous system by reducing the venous dilatation and stasis. It improves the micro-circulation by normalizing the capillary permeability and reinforcing the capillary resistance. It is indicated in the treatment of venous disease, ie. chronic venous disaese & hemorrhoidal disease. Hemorrhoidal attacks: 6 tablets daily for 4 days followed by 4 tablets daily for 3 days. Chronic hemorrhoids: 2 tablets daily. Possible side-effects to be observed: cutaneous allergies, gastrointestinal disorders, headaches and flushes. No special precautions are associated with the use of the drug. Pregnancy: There were no teratogenic observations in human studies. It is, however, recommended that it should not be administered during the first three months of pregnancy. Lactation: In the absence of data concerning the diffusion of the drug substance in the breast milk, breast feeding is not recommended during treatment.